George IV Bridge is an elevated street in Edinburgh and is home to a number of the city’s important public buildings. Measuring 300 metres in length, the bridge was constructed between 1829 and 1832 as part of the Improvement Act of 1827. Named after King George IV, it was designed by architect Thomas Hamilton (1784 – 1858) to connect the South Side district of Edinburgh to the New Town. Two of Edinburgh Old Town’s traditional streets, Old Bank Close and Liberton’s Wynd, had to be demolished for the construction of the bridge. 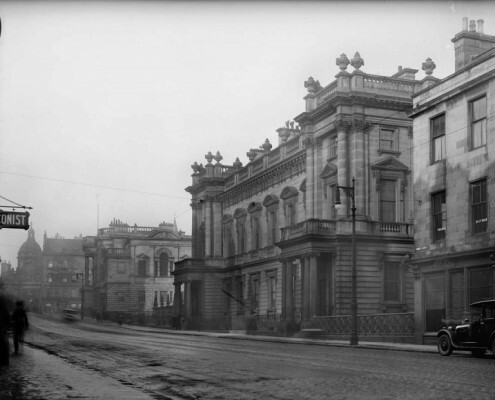 Named after the street, The George IV Bar sits In the middle of the street, where the bridge crosses the historic Cowgate, alongside the National Library of Scotland and opposite the Edinburgh Central Library, both constructed with money provided by the Scottish-born philanthropist Andrew Carnegie. At the southern end of the street is the junction with Candlemaker Row, where the infamous statue of Greyfriars Bobby, is situated.